The US Dollar Index is an index or the measure of the value of the United States dollar relative to a basket of foreign currencies, often referred to as a basket of US trade partner’s currencies. US Dollar Index is a currency Index. U.S. Dollar index originally was developed in 1973 , when the worlds biggest nations met in Washington D.C. and all agreed to allow their currencies to float freely against each, with a base of 100 and is relative to this base. It was developed originally by the U.S Federal Reserve to provide an external bilateral trade-weighted average value of the U.S dollar as it freely floated against global currencies. It has changed once since its 1973 introduction, and that was when EURO was launched in January 1999, replacing a number of European currencies. 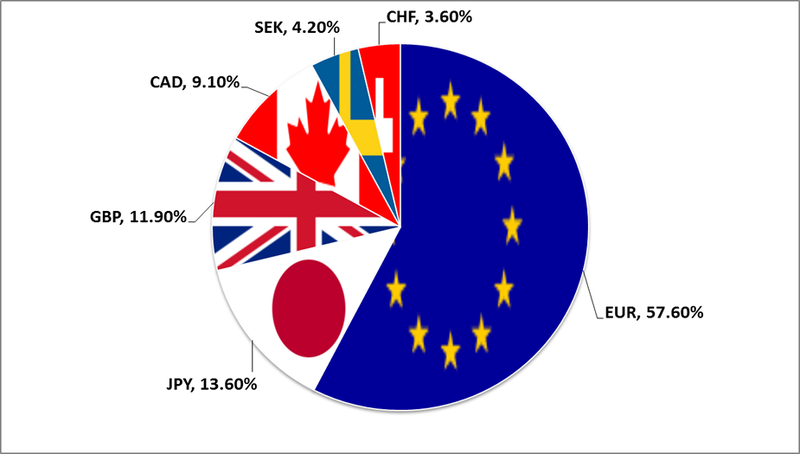 US dollar Index value is the weighted geometric mean of the dollars value relative to other select currencies with EURO (EUR), 57.6 % weight, Japanese yen (JPY) 13.6% weight. Pound sterling (GBP), 11.9% weight, Canadian Dollar (CAD) 9 %, Swedish Krona (SEK) 4.2%, Swiss Franc (CHF) 3.6 %. It is obvious that 24 countries make up a small portion of the world but many other currencies follow the U.S Dollar index very closely. This makes USDX a pretty good tool for measuring the U.S dollar’s global strength. The U.S dollar index is calculated 24 hours a day, five days a week. The present Dollar Index value is 96.38. This means that the dollar has fallen 3.62 % since the start of the Index . (Since the base is 100). In the world of FOREX , the USDX can be used as an indicator of the U.S. dollars strength. Because the (US Dollar Index) USDX is comprised of more than 50 % by the euro zone, EUR/USD is quite inversely related. To sum it up the US Dollar Index (USDX) can be used as a Key indicator for predicting the direction of the USD. (Keep in mind the position of the USD in the pair you are trading). For example if US Dollar Index (USDX) is strengthening and rising, and you are trading EUR/USD, a strong USD will show a downtrend on the EUR/USD chart.